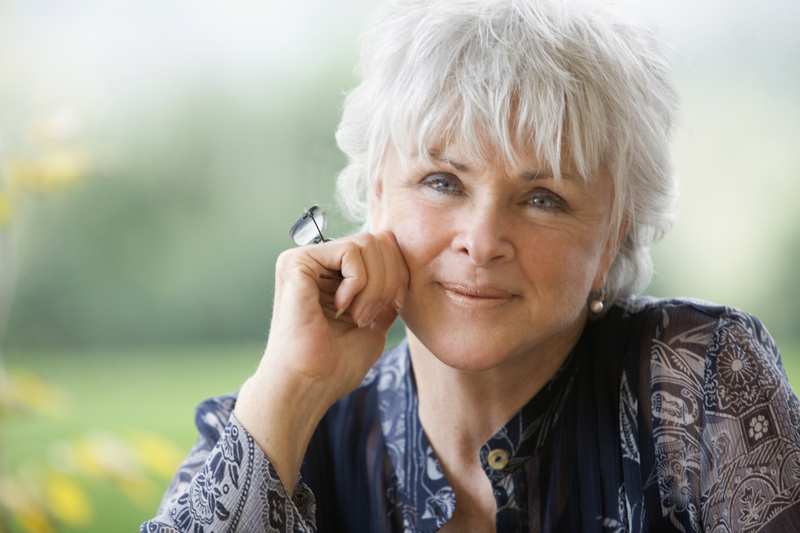 I am posting my March 2007 Byron Katie interview, newly edited to be completely true to the original conversation and transcript. In print in the magazine Pure Inspiration and in the material previously posted online, the interview’s edit involved a significant back and forth between me and Stephen Mitchell, Katie’s husband and a renowned classical scholar, translator, and author. That edit made Katie’s words more accessible for people unfamiliar with her work and The Work. Instead, for this post, here’s what Katie actually said during the interview. Mostly the difference is subtle, but sometimes it is significant. Also, it’s not all quite cleaned up and pretty as I like to think my interviews usually are, so some thoughts and words may trail off or not fully connect or not be fully explained. Tonight, anyway, as I prepare this post, I am finding this entirely refreshing, while hoping that as a reader you don’t find it entirely frustrating. I interviewed Katie by phone, between meeting her in person in Asheville, North Carolina, at an event at the independent bookstore Malaprop’s, and in Tampa, Florida, at a Hay House event, where I also attended a Katie workshop. I am keeping the original introduction I wrote for Pure Inspiration. I took the photo running at the top of the piece a month or two ago at Graveyard Fields, North Carolina, with just this purpose (and blog-post title) in mind. 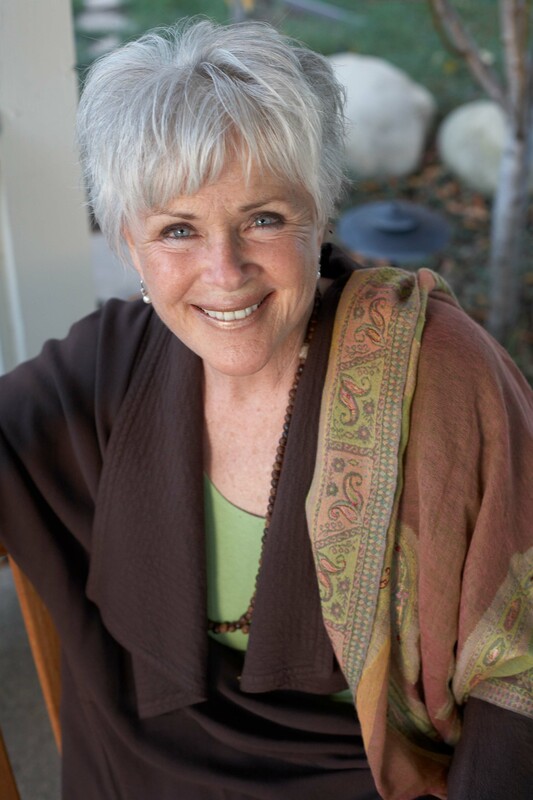 When you meet Byron Katie in person and hear her speak, she shimmers. Katie seems ethereal — like someone not of this world. She also, not infrequently, comes across as something akin to insane by modern conventions. And then the turnaround happens: The longer you are in her presence, the more certain you become that there’s nothing you would rather share than Katie’s astonishing brand of insanity. Does she walk her talk? Katie, which is the name she goes by whether a “Ms.” is attached or not, is pure walk. Question her thoughts? When she speaks, she’ll say something, immediately ask intuitively, “Do I know what I just thought — and said — is true?” and sometimes point out in her next sentence that she doesn’t know what she just said. What she describes as inquiry is unceasing for her. It’s simply her basic mode of being. 5. Turn the thought around. Katie has taught The Work to hundreds of thousands of people through books, DVDs, workshops, and online videos and forums. Her books include the best-selling Loving What Is: Four Questions That Can Change Your Life; I Need Your Love — Is That True? ; and A Thousand Names for Joy: Living in Harmony With the Way Things Are. Learn more about Katie on her website www.thework.com. 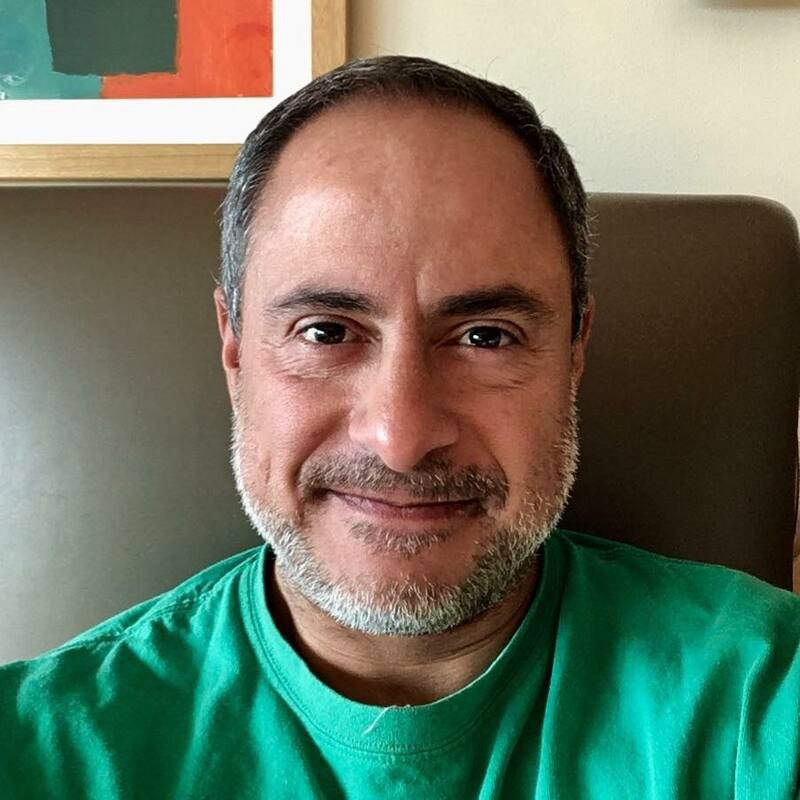 Ray Hemachandra: Hi, Katie, how are you? Ray: I’m very well, thank you. Ray: I also wanted to say how much I enjoyed the event you did with Stephen at Malaprop’s. Thank you. Ray: It was an extraordinary audience and experience — just great. Ray: And I think your work has helped create that freedom — that people are able to reveal deep personal things in front of hundreds of people, things that before encountering your work they might not even have shared with a close friend. It’s remarkable. Katie: You know, I love that, Ray. In psychology, it’s as though we share what we can, and that is as far as we’ve really gone. We get some understanding from it. But with The Work, the more you reveal, the more you have to question and the freer you get. Until, finally, you’re absolutely exposed. And that leaves you in a fearless position, because you can work in the world without the fear of being found out. That is freedom. Ray: Well, Katie, I think we’ve started already, but do you have any questions for me before we begin with the formal interview? Katie: You know, Ray, I don’t. I just have gratitude. Ray: Well thank you so kindly, and I of course for you as well. If joy is natural, Katie, why do so many people need a teacher to tell us about it. Why do so many people live in illusion, so they feel as if they are sad or suffering? Katie: It’s for each of us to look at what we really do believe — what our belief system really consists of. It’s for each of us to look at the concepts that come across our mind and just notice what we believe. If it’s stressful and we question that, we come to see that we absolutely don’t believe it. Whereas prior to questioning it, we absolutely believe it. So, how can we live in joy — and how can we know that we’re supposed to live in joy the way people tell us to — when we’re believing thoughts that bring on sadness and frustration and anger and alienation and loneliness? When we’re believing those thoughts, we think that’s the world, rather than what we’re believing about the world. We’re like lost little children. Ray: Where do we — maybe as individuals or maybe as a collective — where do we go astray? How did it start that we went down the path of living in thoughts and illusions rather than just living in pure joy? Katie: It’s like this, for a simple example. Our mother says, “That’s a tree.” And we don’t have a reference for it. And then she says, “Honey, it’s a tree.” We still don’t have a reference for it. Until eventually we hear it enough times or from enough people and there is a moment that we believe. We see a tree. And it’s separated out the moment we believe. In the moment she says it’s a tree and we believe it, that’s what we’re left with — all the thoughts of our lives for all the days of our lives, in other words. But what are we believing? So, really, my mother didn’t teach me, “It’s a tree.” I taught myself it was a tree the moment I believed. This is where we take 100 percent responsibility for the world we live in. If I don’t like my world, I can’t say, “Well, it’s my mother’s fault. She taught me how to think.” No. The moment I believed what she was saying was the moment my suffering began. It’s not just “mother.” It’s everyone and everything around us. It’s the dream — the dream world. My mother became a believer, and then I became a believer. But then I began to think for myself at 43 years old, somehow, by fluke. (Laughs.) And by grace. And I thought, “Oh, my, my, my, I was mistaken. The world isn’t what I’ve believed it to be, and I am not what I believed me to be, and neither is anyone.” So, I live in a state of grace, where I don’t have to know. Ray: Everyone has their own stories and beliefs, as you said. But I imagine there are some especially common ones — common thoughts and beliefs that people realize they hold when they start doing The Work. What are some of the beliefs you encounter most often? I ask, “Is there anyone in this room who has never stolen?” No one raises their hand. So, reality is: Should people steal in this world? Yes. How do I know they should? They all do. Then, turned around: I shouldn’t steal in this world. I’m the one I need to work with. I’m the one who changes the world if I can follow what I think should and shouldn’t be lived in this world. I have a list of universal beliefs — I think they’re on my website — and they are amazing beliefs, like, “No one cares” or “You don’t care about me”; “I should be successful” or “I’m not successful”; “I don’t have enough money”; “I’m too tall or thin or fat”; “I shouldn’t have done it” — oh, my goodness, they go on and on and on. But when we begin to question these beliefs, all of sudden the question “Is it true?” begins to live in us. It comes alive. It begins to rise as kind of a partner for all of these stressful universal beliefs that we’ve been stuck in for centuries. Also, the question “Who would I be without that thought?” begins to live, because we begin to identify and relate stress to the concept that’s happening in the moment. And when that happens — oh, my goodness — what a world! In that moment, a state begins to happen that I call unceasing meditation. We cease to be body-identified. The mind becomes a joy to itself. It begins to dance with itself! It begins to be its only self. It begins to be its ultimate relationship and love and friend. It dances and sings, and the physical world cannot compete with that. The nature of mind is that it just cannot love enough once it loves itself, just like it cannot oppose enough when it opposes itself. Ray: What about people who have trouble getting beyond the intellect? How do you undo thinking without thinking? Is inquiry not thought engaging itself or deconstructing another thought? Katie: Actually, it’s mind seeing through itself and understanding itself. I like to say understanding is the power. The only and dearest relationship is the mind’s relationship with itself. In other words, the ultimate and dearest — and, again, only — relationship we have is the relationship we have with our thoughts. As far as intellect, what else is there? Without intellect, no story and no world. If we are in silence — in absolute silence with no thoughts — for 10 minutes, it’s only a thought that tells us we were silent for 10 minutes. Our only proof is a thought. Mind is everything. There’s nothing that it’s not. If people are living their lives for security and comfort and pleasure, then mind’s every waking moment will be plotting that. In other words, that’s how it stays identified — as a body, as a you. The moment it begins to question itself, the mind becomes so clear that it starts working with itself rather than the body’s identification. Ray: Something that really resonates with me is when you talk about how easily positive thinking can be turned around, because people still are basing their well-being on thought. So, affirmations like “I’m loveable, I’m loveable, I’m loveable” have something even stronger running underneath: “I’m not loveable.” You feel better until you realize you’re out of money and you can’t make your mortgage payment, or you look in the mirror and see you’re gained 25 pounds or just look a little older and more wrinkly and, also, realize that you actually care about such things. Then: Are you still loveable? Ray: Would you please talk about how questioning your thoughts — the process of inquiry — can actually better support joy than does trying to think joyful thoughts? Katie: Questioning our stressful thoughts, we come to see they’re not true. So, if our stressful thoughts aren’t true, what does that leave? It leaves, “I am loveable” — the very thing I could never make myself believe, because “I’m unloveable” overrides it when the chips are down. What we really believe is what we manifest. What we believe, we see. In other words, we cannot see what we don’t believe. So when people are talking about manifesting, we can say, “I want a car, I want a car, I want a car,” but if the mind is running, “I don’t deserve it, I’ll never be able to afford it, I’ll never be a success” — if all those things are running — then those things are what we’re really manifesting. They are exactly what’s running our life. And as long as we believe those thoughts, thinking positively is not strong enough to override our negative beliefs. What are your underlying beliefs? If I want something, I go get it. Anything that I believe will stop me, I question. And I might be wise enough in that questioning to appreciate what I already have. I think that’s the trick: wanting what I have. Really, I don’t know if that’s the trick or not. What I know is that it’s a wonderful world to have what you want at all times. Ray: Earlier you said The Work was born “by fluke and by grace,” which I thought was a great turn of phrase. Who were you when The Work was born, and who are you now? Katie: Who I believed myself to be was a hopeless case. I would wake up in the mornings and notice I was still alive and breathing and hate God, hate myself, hate life, and contemplate ways of killing myself. I was full of rage. My self-esteem was so low that I actually slept on the floor every night, because I didn’t believe I deserved a bed to sleep in. One morning as I lay sleeping on the floor, a cockroach crawled over my foot. And I opened my eyes out of this dead sleep — about a 43-year sleep — and in place of all that darkness was a joy that I can’t describe. No one told me that you could be alive and be happy. No one told me, and if someone had I wouldn’t have believed them. I thought that you had to die — physically die — to escape. I was absolutely unidentified, so I can’t say “I.” It was without identification, and then in a moment all the thoughts of the world — all the thoughts that had depressed me all those years, all those terrifying thoughts that told me how worthless and terrible I was — they just hit my mind. My mind was bombarded with them. And I saw, honey, that they weren’t true. I began to laugh — or, without identification, we can say it began to laugh. It or I just roared. I like to say it was born out of laughter. So, with what I saw in that moment, The Work was born. It was when I believed my thoughts that I suffered. But when I didn’t believe my thoughts, I didn’t suffer. I’ve come to see that this is true for every human being. So, the first two questions — Is it true? Can you absolutely know that it’s true? — are what I saw when the thoughts hit. They weren’t true. The thoughts weren’t true. And I invite everyone to see the same thing that I saw. And then I saw that there was no identity until the thoughts hit. That’s the third question: How do you react when you think that thought — when you believe that thought? The whole world is born in that moment. That’s where the dream is born. It’s like the world is a projection of our thoughts — the thoughts we believe. Without identification before the thoughts hit. It was all upside down and backwards. You know: true, not true, dream world, real world. So, that was all four questions and the turnaround in a moment. I can just talk about my world, and people relate to it because it’s so familiar to them. It’s them, it’s not me. They’re hearing themselves. Inviting people to inquiry is much more powerful than describing the experience. When people ask me to describe it, I do, because it’s all valuable. But if people hear me tell the story, they often say, “Oh my gosh, oh my gosh, oh my goodness, I get it, I get it!” And it’s not enough. It’s not enough. Those questions — when you think about a thought, when you’re believing a thought or concept and you question it — you realize that it changes things. Every cell in your body is awake with inquiry. There’s nothing then that can believe the old thing again. Every mind deserves to be free. Because when the mind is free, that’s the end of suffering. Ray: When you describe your realization — the cockroach moment —it sounds almost revelational. Do most people doing inquiry have revelations like that, or is it usually steady work in making the understandings become second nature? Katie: Steady work, and making the understandings become second nature — or first nature. People have the questions come alive in them. I’ll run into people two, three, or four years later, and it’s still happening every day. It’s just a constant thing when the mind starts to wake up to itself. Because mind is infinitely creative. And when it’s not stuck, oh my goodness, that’s where the joy comes from. Something happens, and the way we think of it, understand it, see it, is actually hilarious, whereas before it would depress us. It’s only right. It’s the same for me. That can be “He told me to go away” (Katie employs a low, morose voice) or, what I would say, “He told me to go away!” (Katie says in a bright, happy voice). For me, if somebody tells me to go away, that is an opportunity for me to give them a better life. And that’s an opportunity for me to know and realize where not to be. It’s an opportunity for me to see what could be better than being with that person I love. So, war, genocide, poverty, hunger, and what you earlier referred to as “a world without trees” — you love all parts of the world because you love what is. Can lovers of what is still be agents of change, and how can they do so without the “should” — that something should be other than what it is? Katie: Let’s take war for example. If I have the thought, “They should stop fighting,” then I can’t know that that’s true. Who do I think I am, God? Who am I to say what’s right and what’s wrong? And, when I turn the thought around — the thought that war, let’s say war in Iraq, should stop — the turnaround is the war in myself should stop. War that I have anywhere in my life should stop. Let me work on that. I’m not in Iraq. I’m here in California. Have I had an argument with my husband today? Have I been at war with someone in my life today — or with myself? Let me work on that. That way war is ending somewhere in the world. If I think the environment in the world needs to be cleaned up, let me clean up my own environment. Let me clean up the environment in my head — let me work with that pollution and that ecosystem. And that’s huge: just to clean up one ecosystem. The power of one — look what Gandhi did. He was clear. Well, I don’t know if he was or not, but he was certainly clear enough for me. The power of one! If I can’t stop war in my life, how can I expect politicians to stop war in the world? I can’t. And we all have equal wisdom, so if I can do it then I know that anyone can do it if their mind is open to answering just four simple questions and beginning there. I didn’t seek a way of sharing this. I just lived my life. And word of mouth began to happen because the change in me was so radical. We want to know: How is it possible, having really courageous, fearless people like Gandhi? What’s happening in the world is a natural course of events. But affecting the world is obviously possible when we see people in the world who we really love and respect and we see how that they affect our lives. So, it’s like that, Ray. Ray: A personal sticking point is identification with my child’s well-being. Here’s what I mean: If I get cancer, I can accept and love what is and even approach it joyfully I think. But if my child gets cancer — I have a young son born in 2000 — I think I would be devastated. Katie: Okay. So, Ray, what makes you think that you could handle cancer any better than he could, other than your ego belief that he couldn’t handle it at least as well as you could? And, also, if something happens to your son, your thoughts about not having him in your life is what your terror is. It’s not about his life. It’s like when your son is healthy and happy, you’re healthy and happy. And when your son is not healthy, let’s say you’re unhappy. But that doesn’t make sense. If you question your thoughts about when your son is not healthy, you come to see that you’re the only one you’re worried about. It’s like without him, you’re not happy — so it’s all about your happiness. You want him to live for you — for your happiness. It’s like this: If I’m okay with dying, my son is at least as enlightened as that. If I’m okay with my cancer, my son is at least as enlightened as I am. And my son wouldn’t be afraid to die, if not for what we have taught our children — I think our children are afraid to die because we’re afraid to die. My children have really come to understand that they can die and it’s okay with me. They don’t have to live for me. And what about when we’re afraid for our children’s well-being? How do you react when you think the thought something terrible could happen to your son when he’s out of your sight at 6 years old? How do you treat him when you think the thought that he’s not okay? Look at that. You become frightened, and you become overprotective. You begin to teach your child some very fearful things. We don’t even realize we’re doing it, because we try to hide it. We think we’re doing a good job. And yet they pick up all of our concepts and fears. Who would I be without my fear — without the fear of losing my son when he has cancer or he is, let’s say, dying — who would I be without the thought “I need my son”? I’d be fully present with him. I’d be not missing one second — not one moment — of our lives together. It’s just too valuable to take time out for my fearful thoughts about what would happen to me without him. That’s all about me, me, me. I invite everyone to question their thoughts about their children and allow their children to be free. That’s when we stop teaching our children fear. Ray: Thank you, Katie. You also say, “It takes only one person to have a successful relationship.” What do you mean by that? Katie: Defense is the first act of war. I see that clearly. So, if someone says, “Katie, you are out of order,” over something I’ve said, or, “Katie, you are wrong,” if I defend myself or justify myself, then I have just started the war. They say, “Katie, you’re wrong.” And if I say, “How dare you say that? I have studied and studied.” Or, “I am an expert in” whatever area we’re talking about. Or, “No, you are wrong! And I think you’re rude!” Or anything like that, and if we don’t say it out loud, maybe we think it, but that’s stressful. The moment I’ve defended, in any way, I’ve started the war. Here’s the other way. Here’s what I would want for humanity, because this is what I have come to see is true: it’s so simple when we listen to people. When people say they want enlightenment, this is the simplest way. What’s happened? Rather than an enemy, I’m standing there with a friend who can give me information — who can really enlighten me. They can add to what I’ve got. It doesn’t mean I’m going to lose or change what I’m believing. But I have more information then, and that’s much more intelligent. Who knows? I could be wrong. I love to not defend ever and to open my mind and take in what can always add to me, not take away from me. Ray: Katie, do you still do The Work consciously and subject your thoughts to inquiry purposefully, or does releasing thoughts come effortlessly to you now? Katie: Effortlessly. Because when you don’t believe something, you can’t make yourself believe it. There’s nothing you can do to believe it again. You either believe it or you don’t. 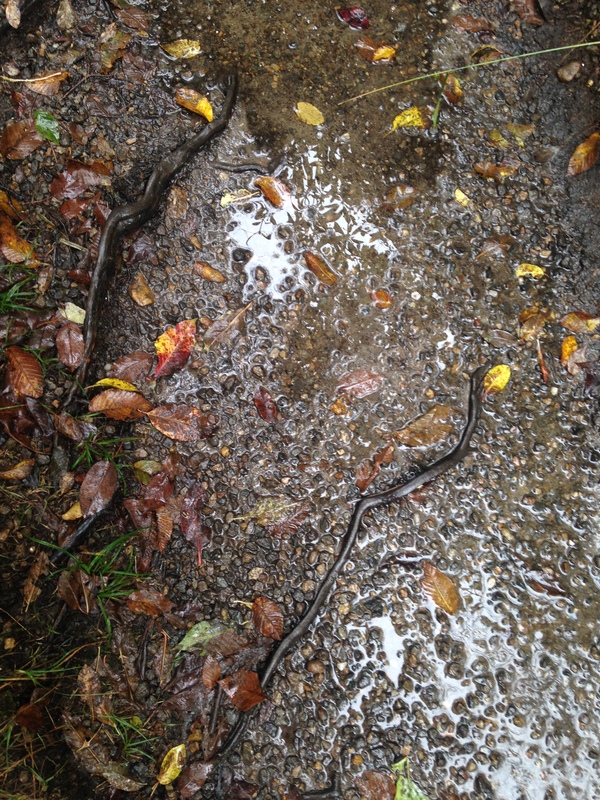 Let’s say you see a snake in your path on a walk, and you’re terrified of snakes. You jump back, and you’re just terrified. Your brow is sweating. Your heart is racing. You’re paralyzed with fear. Then, maybe the sun shifts through the clouds a little differently, and through your fear you look down again and you think, “Oh, my goodness, that’s a stick. How could I ever have thought that was a snake?” Or let’s say it’s a rope. Your whole body shifts. It begins to relax. It begins to come back into balance. It’s a remarkable thing. You even laugh at what fear can do and what it does to your physical being. Then someone else comes along, walking, and suddenly screams, “Watch out! It’s a snake!” And you laugh. Now, that person is terrified, suffering, in pain, afraid for her or his life, afraid for my life, and I laugh? I think nothing of the “snake,” but that person’s really frightened. If they run, and you yell, “It’s okay, it’s okay,” they won’t believe you. Because they believe that rope is a snake. So, when you question what you believe, you leave the world, really, and what the world believes. It puts you in a very interesting position. When people are suffering, you don’t suffer. You know every problem is a rope. You understand it, because you once thought it was a snake, too. But how can we fear what we can’t fear? We can’t make ourselves fear that rope again, even if we stand over it for a thousand years. It’s impossible. That’s what The Work does. It challenges every problem in the world. It invites everyone to discover that the snake is a rope, and there’s no exception to that, Ray. But this work is for people who are open to it. It’s not a little thing to lose your identification and who you believe yourself to be, and that’s what this work threatens. It threatens the ego. Ray: You say when people start to do The Work, it’s best to do it on paper. Why? Katie: Because the mind is so tricky. It will say, “No one cares. Is it true? Well, someone does. Let’s see: So-and-so doesn’t care. Well, maybe they do. Well, there is someone who doesn’t care.” It just shifts and shifts and shifts, so it can keep all of its concepts intact. But if you identify what you’re believing and you put it on paper, there it is. It’s stopped. It’s mind on paper. Our fearful mind has never been stopped before. It’s brought into the world and stabilized in the world — on paper. So, by putting mind on paper, we can put these four questions and the turnaround — The Work — up against it. Notice how our mind wants to shift it every way in the world, so it doesn’t say what it says on paper. But just leave it, and there it is, just the way we’ve been believing it, no matter what the mind says. And also, when people do The Work, people can notice that when they begin to justify or defend, or go to a story, The Work stops working, because in that moment they’re no longer doing The Work. They’re doing what mankind has always done. I invite people just to notice that and come back to The Work, and simply answer the questions. Be still, and take your time with each one of them. Your life depends on it. Your entire joyful life depends on it. Ray: The first question is, “Is it true?” The second question is, “Can you absolutely know that it is true?” I wonder: For people who start regularly doing the work, does the second question eventually fall off, because they fully probe things when they ask the first question? Katie: Sometimes the second question doesn’t even apply. And sometimes the concept you’re questioning makes more sense to ask just the second one and not the first one. For me, I wouldn’t miss one of the four. I like to say the first question is there, and just in case you miss it, there’s another one to back it up. For example, if the concept is, “John hit me,” then is it true, yes. John hit me. Can I absolutely know that it’s true? Yes. And then just move to the third one: How do you react when you think that thought? And just trust the questions, trust the work. People sometimes believe every answer should be no to the first two. That’s not true. This is personal work. It is meditation. And we come out with the answer that is ours. When we’re not defending and justifying, and we’re being very still, our answers can and do shock us. Ray: Interesting, thank you. One thing I have heard in the event in Asheville and also watching video recordings of you doing The Work is that people very quickly get to the no, because they expect that’s the “right” answer to give. So that was very interesting: Sometimes you say yes twice. Ray: How about the third question: How do you react when you think that thought?—the cause and effect part. On what level do people react? Is it a gut reaction? Is it emotional? Is it thought? Katie: It would be like you coming home expecting to see your son running into your arms. You’re very happy walking through the door, and you look around — he’s not there. And then you look around more, and you can’t find him. And then you look around and, if you’re married, your wife says, “Oh, my goodness, I haven’t seen him in a while,” and then you both begin to panic. Notice the emotions that happen on a scale from 1 to 10. They can go from mild discomfort all the way up to real panic. Nothing’s happened, except you’re thinking thoughts like “He’s in trouble,” “He’s missing,” “I need to find him,” “Something terrible has happened to him,” or “I need to get to him.” Whatever these thoughts are in that situation — “He could be hurt,” “He needs me” — how do we react when we think each thought? And then when we find him — maybe he fell asleep in the closet, but we even called 911 when we couldn’t find him. We find him asleep in the closet. How do we treat him when we think the thought “He’s missing”? He’s asleep, and we wake him out of a dead sleep. How do we react when we think those thoughts? We grab him up. While one person might simply be relieved, another person might grab him up and start crying and holding him. Just imagine the little guy and his fear, and what that would mean to someone who was just taking a nap, after all. So: How do you react when you think this thought? How does it feel in your body when you believe the thought? How do you treat other people and yourself? Is this where addictions kick in? Is this where you begin to overeat or smoke the cigarette you said you’d never smoke again? That’s all in the third question. It’s meditation. You sit and you watch your life as a result of that thought. Maybe you go back to your childhood and then all the way up to the present. How do I react, what happens, when I believe that thought? And your whole life will just appear in front of you in images. It’s quite an amazing question. And then the fourth question: Who would you be without the thought? The result of that question is calmness. You can watch your life without the thought, and see exactly the same life and events. Let’s say, for example, the child is asleep in the closet, and people are afraid something has happened to him. Who would you be without the thought “Something terrible has happened to him”? The thought is like a nightmare that has surfaced, even though we don’t really want to admit it. However, that nightmare is what’s running for some of us. It surfaces when we can’t find him after the first five minutes. So, we watch: Who am I without the thought “Something terrible has happened”? And we get to that closet a lot quicker, for example, because the mind is clear. It’s not panicked. It’s just more intelligent and calm without the thought. It does the same work, but it’s so much more effective. Our children deserve that. And the world deserves that kind of clarity. Ray: Do people sometimes struggle to answer that fourth question? Because you’re having the thought — it’s part of you now — so you essentially are imagining yourself as someone else, even if that’s perhaps a truer self you’re imagining? Katie: No, what I invite people to do is to look at their lives just the way that they have lived them. Not to change anything, and not to do positive thinking at all. Just look at yourself going to the market yesterday. Look at yourself going to work yesterday. Look at yourself having breakfast, lunch, dinner. Just look at your life without that thought. It’s the same life, without the thought. It’s quite an amazing experience to see the same life with and without the thought. We come to see how crazy a thought can make us when we believe it. And then when we turn it around — for example, “Something terrible is going to happen.” The opposite is “Something wonderful is going to happen.” To find genuine examples of possibilities without being crazy — genuine, real possibilities of what can come out of a situation we’re experiencing. For example, our little child asleep in the closet: “Something terrible has happened to him,” and now, “Something wonderful has happened to him.” Then, you start looking for examples. And, again, it really helps when you’re looking for a little guy. And if it comes to calling the police, they can say, “Did you look in the closet?” You can honestly say yes, and let’s look again, but without the panic. With the panic, sometimes we can’t even answer: “I don’t know where I’ve looked.” We’re just panicked then. Fear is blind. There are some options in it, but they’re very limited as compared to the options available to the fearless mind. Ray: Would you talk about the turnaround, and specifically why it’s so important to the process of inquiry? Katie: Because it shows other possibilities. It also shows the mind what is as true or even truer. It’s most often that way — that the turnaround is as true or truer than the negative. What’s an example? Let’s say, “John should apologize.” Turned around: “I should apologize.” But, it’s like, “Me? He is the one who harmed me. He owes me the apology. Well, let me look again. I should apologize to John. Well, okay, I really did do this and this to him. But he deserved it! No, let me see: I should apologize to John. Let me do what I expect him to do. Let me get my own house in order here.” And if I think it’s difficult to do, then I begin to understand why it’s so difficult for John to apologize to me. And my job is to get the job done. You know that, Ray. My job is to get the job done. My job is to turn it around, see what I have done, what my part is, apologize, go back to that person and ask how I can make it right. Usually I don’t even have to ask — I know. One thing is this is the end of gossip. This is the end of passing on negative thoughts about people. It’s the end of talking about a world that’s so terrible. Rather than judgments like that, we begin to live in observations that can be intelligently worked with and changed and shifted. I have an expression I say a lot: I’m in a hurry. There’s suffering on this planet that is so easy to break through if the mind is open to doing so. Ray: Just so you know, Melanie is serving the function that Stephen did on stage for you — she made me promise not to go much longer than an hour, and I want to honor that. So, I’m going to flip the tape, and again so you know, we have 12 minutes left. I’m curious about your process with the book A Thousand Names for Joy. Your husband, Stephen Mitchell, presented you excerpts of his translation of the Tao Te Ching and you responded. Did you respond instantly? Did you sit with them? How did your responses come to you, and then, did this work provide or provoke any new understandings for you? And I would just talk about my life in reference to what I thought was the meaning in that chapter of the Tao. He would write down everything I said, and that turned into the raw material for the book. Then, Stephen is brilliant at turning three pages of raw material into the most beautiful prose. He’s just expert in his translation, not to move the meaning at all and to even use my words — I don’t know how he does it. He’s so selfless in that way. Ray: Katie, what do you think the world looks like when everybody comes from a place of pure love and joy — when everyone lives with that understanding? Katie: It’s amazing. We all begin to do what we can do, just like we’re doing now, to clean up the planet and to find solutions rather than fight. It just happens everywhere. We begin to not be human, as we’ve known it, any longer. But to be just creative minds and action, whereas right now we’re confused minds and actions, and our environment mirrors that back to us. We have the opportunity to — oh my goodness! — it’s unspeakable. It would be like all of us doing the most wonderful things, and we would never know who did it. We would never know who did it. Like pollution — we never really know who’s doing it. But if we’re awake enough, we can know our own part. And so it would be like living the opposite of that, where no one knows that I’m the one that — for example, all day long you do something that is a contribution and helpful, but you don’t ever get found out. No one knows it’s you. You realize, “My life is a contribution.” Even breathing is a contribution. Low self-esteem is not possible when you understand the nature of everything. Depression is not possible. It’s just where the universe looks, obviously, friendly. And if everyone lived that way, it would end up with us living as our nature. And if we weren’t fearful, we would. Ray: You entered doing this work — teaching and writing books, giving seminars — quite by accident, I think. People asked you questions about your experience and then started to follow the same path. Katie: Yes. People just wanted to know what happened to me. My husband at the time was so confused. It was like he was living with someone who looked like his wife, and that’s where all the similiarities stopped. And that was very confusing for him. He used to go through the house, saying “What have you done with her? Where is she? I didn’t marry you. Who are you? It’s not fair. I want my wife back.” Because he would say something, and my response was so different and unrecognizable. My children were the same. They were astounded. So, it was like that for people. They would want to know what happened. What was it? And then word of mouth happened, and people would invite me to come and talk. That’s what happened. And, so, I continue to keep those questions up on the website for everyone who’s interested. When people ask, “What is The Work?” my website has them go to the worksheet, where they can put their mind on paper, and the one-belief-at-at-time worksheet, where they can just work with one concept at a time with instructions, and it’s all free. I just want it available. Everyone has a right to know it exists, and that’s my job. Ray: Often, when I end an interview, I ask, “What’s next?” or “What goals do you have for the future?” I imagine you would not be able to answer that question right now. Is that true? Katie: Well, as as far as I know, we’ll eventually end our interview. And that’s all the future that I can project — and I don’t even know that that’s true! Ray: We could keep going forever. Katie: You know, Ray, you are amazing. Thank you so much. I appreciate you. Ray: — not that you have any. Katie: What I say is if I needed them, I’d get some. Ray: Thank you, Katie. Be well, and take good care. Katie: And you. And kisses to your son. Aren’t you blessed, Ray? What a gift. Ray: Incredibly blessed. Thank you, Katie. ← A Little Sweet Bowling Vignette: So Old!